This is a delicious spring braise, it's still very intense but much lighter than the red-wine braises of winter. It also celebrates glorious new season artichokes and broad beans. It's important that you buy real veal osso buco for this, rather than the more commonly found yearling beef. The pieces will be reasonably small, and the meat will be pale with quite a loose feel to it. The advantage here, apart from the more elegant size, is that the meat will cook relatively quickly, but it will still be richly flavoured and meltingly tender. 1. Preheat the oven to 160C fan-forced or 180C conventional. 2. Using a mortar and pestle, crush the garlic, oregano, bay and a little salt to a paste. Add the veal to a large bowl and smear the paste all over the meat. 3. Add half the oil and the pancetta to a large, heavy cast-iron saucepan over medium heat and fry for two minutes to render out some of the fat. Add the veal in batches and cook without moving for two minutes, then start to rotate the pieces to brown evenly. Season with black pepper and a little more salt and remove from the pan. Repeat for the remaining veal. 4. Add the eschalot, celery and carrot to the pan, with a little more oil if necessary, and cook for 15 minutes over medium-low heat, stirring occasionally. 5. Add the anchovies to the pan and stir for a minute or two. Add the wine and bring to a simmer over medium heat. Add the meat back to the pan and pour in the stock. Boil for three minutes before adding the tomato and artichokes. Cover the pan and place in the oven for 30 minutes. 6. After 30 minutes, remove the lid and cook for about 40 minutes until the meat is tender and falling off the bone. 7. Meanwhile, cook the pasta in boiling salted water until al dente. Drain briefly and toss with the butter and parmesan in a large serving bowl. 8. Add the lemon zest, parsley and broad beans to a medium bowl and season with salt and pepper. Drizzle in a little oil and toss to coat. 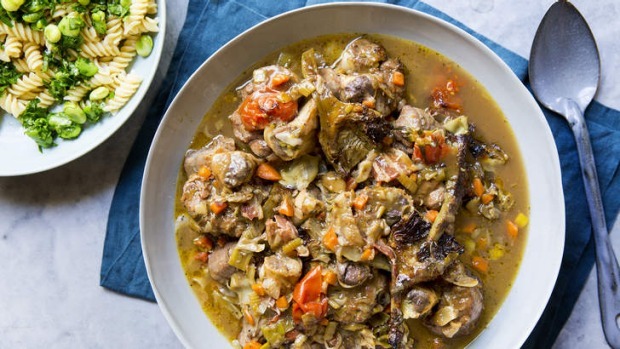 Tip over the pasta and serve alongside the osso buco. 1. If you wanted to make this heartier, you could increase the amount of tomato, skip the artichokes and use red wine instead of white. 2. Using smoked kaiserfleisch instead of pancetta is a simple way to really change-up the flavour profile. 3. Most lemons are waxed, so, especially when I'm using the zest, I prefer to buy organic, un-waxed ones. 4. Rather than pasta, you could serve this with soft polenta or the classic accompaniment to osso buco, risotto Milanese (saffron risotto).